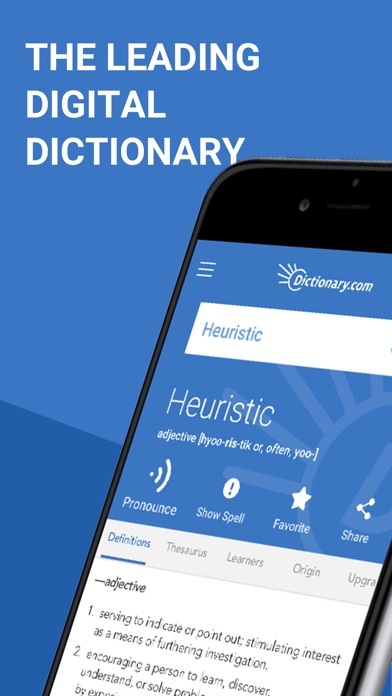 Download the essential and most comprehensive dictionary app for dependable definitions at your fingertips. 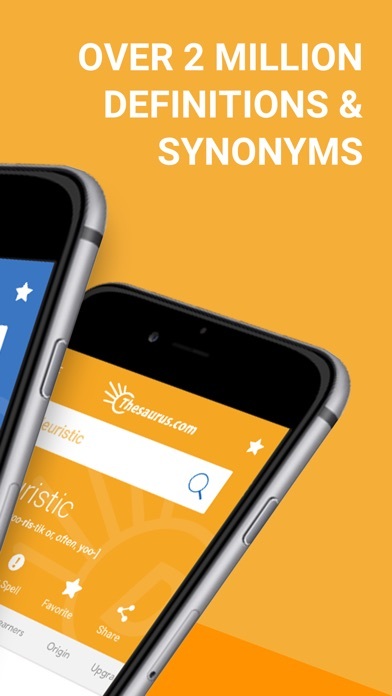 Dictionary.com is the leading free English dictionary app for iPhone – with over 2,000,000 trusted definitions and synonyms, the Dictionary.com app is designed and optimized for your mobile device. Works offline! 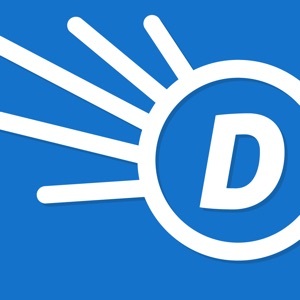 Install the offline dictionary for access to definitions whenever you need them. 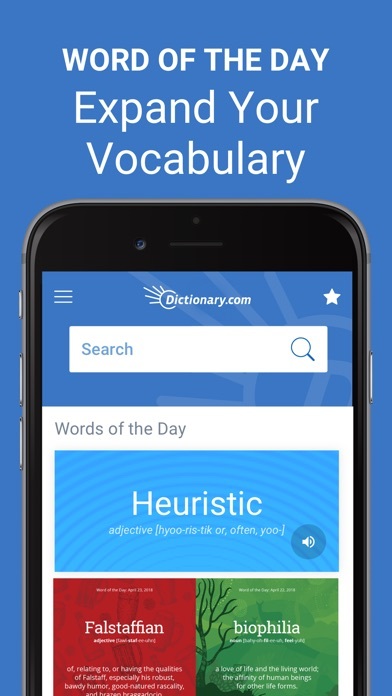 In addition to the trusted reference content from Dictionary.com and Thesaurus.com, this app includes: - Word of the Day – learn a new word each day and expand your vocabulary - Audio pronunciations – never mispronounce another word - Voice search – find the definitions you’re looking for anywhere, anytime - Content Collections Carousel includes Word Trends, Grammar Tips, , Slideshows, and Word of the Day - Quiz widget - test your vocabulary skills (are you prepping for the SAT?) with our Word of the Day quizzes - Word origin and history - discover etymology on even the strangest words - Favorite words and search history - customize your recently searched word list and never forget the newest words you’ve learned - English Spelling help - not sure how a word is spelled? 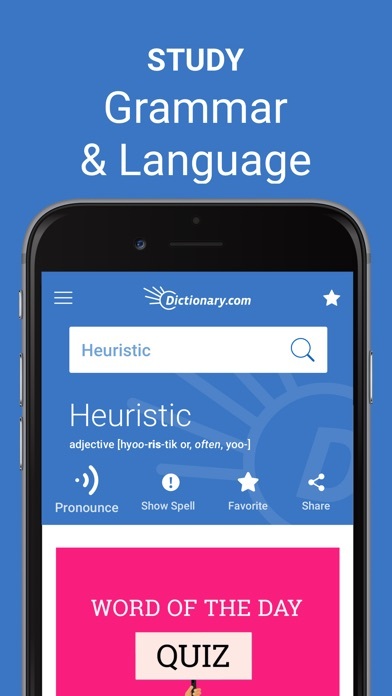 This app will find it for you - Local look-ups - take a look at the words searched by location - Learner’s Dictionary - includes extra information about word usage for English learners - Optimized for Apple Watch! 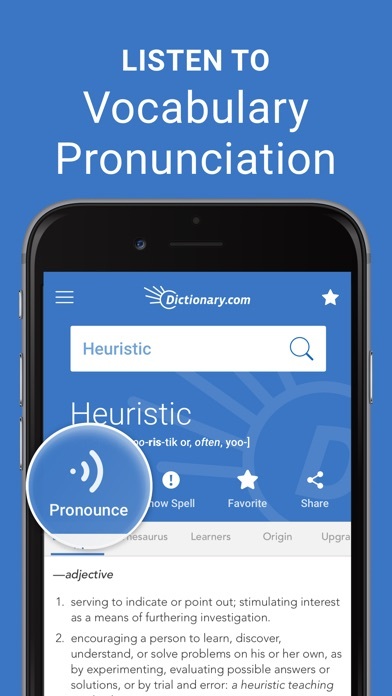 Get even more from your app with our Upgrades: - Example Sentences - Encyclopedia - Idioms and Phrases - Medical, Science, Rhyming Dictionaries - Offline Dictionary + Remove ads Or you can get all of this additional content and remove ads for one low price with our Pro App.